Cheekbone reduction is a common facial reshaping surgery to help narrow the wide midface. It achieves this effect by bringing inward the convexity of the zygomatic arch. Through an intraoral anterior osteotomy through the zygomatic body and an osteotomy through the posterior process of the zygomatic arch before it attaches to the temporal bone through a skin incision, the zygomatic body-arch segment is moved inward and fixated with small plates and screws. Such cheekbone reductions have gone through a variety of technical modifications over the years for both the anterior and posterior osteotomies. But despite these improvements cheekbone reduction osteotomies aren’t perfect and some asymmetries or under reductions can occur. One of the most common postoperative concerns that comes to me is an otherwise good anterior cheek reduction but some residual protrusion at the posterior osteotomy site. This could occur because the bone was not moved inward enough at the osteotomy site. 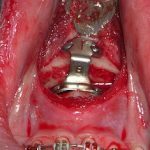 But it can also be that the osteotomy was done too far in front of the arch-temporal attachment, leaving a residual protrusion behind the osteotomy site. While re-opening the posterior osteotomy site is always an option, an alternative approach to moving the posterior bone further inward is a percutaneous technique. 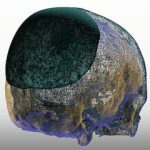 Confirming with a CT scan that the protrusion is caused by a posterior arch segment that can be moved further inward (and not part of temporal bone itself), a 2mm osteotome is pushed in through a small nick skin incision directly over the protrusion. The osteotome can then be ‘walked’ along the arch segment creating osteotomies to collapse it inward. It is a procedure that can be done under local or sedation anesthesia. It causes no bruising and minimal swelling and virtually no recovery. While the frontal branch of the facial nerve passes through this area, the blunt dissection of the osteotome down to the bone pushes it aside should it be in the area. It is a touch technique that is aided by the knowledge of the anatomy from the CT scan.